Michael Moore on the Stop the NDAA! Panel. 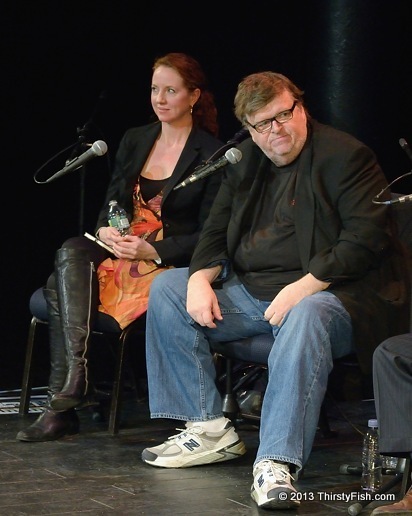 I'm not sure what to make of Michael Moore. He is an Academy Award winning filmmaker, social critic, author and a liberal activist. In his documentaries, he tackles issues rarely justly covered by the mainstream corporate media: An inside look at the Iraq War, assault weapon ownership, corporatism, the health care system, and globalism. His take-down of corporate shill, Dr. Sanjay Gupta was gratifying for those of us who understand the inner workings of the healthcare system. On the other hand, Michael Moore promotes Democratic politicians with the justification of "lesser of two evils". I find the so called "liberal" politicians, likes of presidents Bill Clinton and Barack Obama, to be more worrisome. The "I feel your pain" language of such "liberal" politicians only conceals the flourishing plutocracy that has arisen. Although the majority of Americans, nurses and physicians support a national health care system, President Obama took it off the table after his election and instead signed into law Patient Protection and Affordable Care Act, a law, written for insurance companies by insurance companies. And, as expected, Health Insurers are raising rates by double-digits. Life isn't black and white. We constantly face tough choices. On the other hand, "the lesser of two evils", no matter how you look at it, is still evil. I appreciate Michael Moore for bringing forth and emphasizing issues dangerously concealed from us. But I do disagree with him on his persistent endorsement of "liberal" politicians as "less evil". They are not.